Well the business visa went through! I can now travel in and out of the Russian Federation until the end of November 2017. I got to the Heathrow Airport a tad bit too early today so I’m sitting at a restaurant nursing a Guinness as I write this. I stayed at my sister’s place in Cambridge this past week, and we had a great time. It was wonderful to be able to catch up with her, my other sister Nikola, and my nieces and nephews. Also shout out to my brother-in-law Andy for keeping Guinness stocked in the fridge this week: team player. I took the train from Cambridge today around mid-day, and was to report to the Russian Embassy in London by 16.00 to collect my passport. I was a bit nervous this past week that it wouldn’t go through because of some careless error on the application. I took the tube and lugged my luggage not only to the embassy, but also to Heathrow. To all you students out there it cost roughly £6.00 in total for transport throughout London to get to the embassy and then to the airport. I think a London cab or Uber would have run me about £50.00 today when all was said and done. So things I am excited for this summer: my internship, blini, banya, borscht, continuing to improve my Russian conversation, and of course all the other wonders that Russia has to offer. This summer won’t be all fun and games, but I hope to get in as much enjoyment during my last few months in the motherland as I can. I know in earlier blog posts I made a checklist of sorts regarding things I wanted to do during my time in Russia. I’ve checked off that whole list, except for the Transsiberian Railroad. After my experience during an 8-hour train ride in a Russian train, I thought that I had discounted this checklist item forever. Over the past couple months, however, I’ve had a bit more free time and as such have been planning what I want to accomplish with my remaining time abroad. 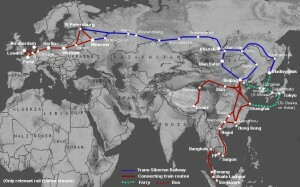 I am in the process of convincing two or three of my friends from study abroad this past year to do the railway from Moscow to Vladivostok with me. It would be really awesome for them to come, but if they don’t I’m pretty sure I will still do it. It would be anywhere from a week to two weeks depending upon how long I spend at the various stops throughout Russia. I’ll post a route map below. 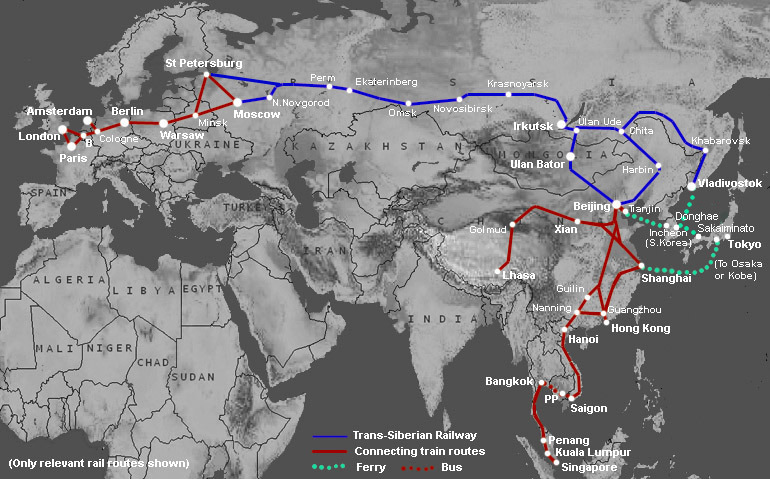 Follow the dark blue route below that doesn’t veer off into Mongolia. The preliminary plan right now would be to stay in Russia to avoid the hassle of procuring another visa for China, but we’ll see what happens. I would start the trip at the beginning of August, giving me roughly two weeks before I need to fly back to the US to start my final semester at UPS. Anyway, I am going to head off to my gate to start the always wonderful security screening process, so bye for now.